Congrats to Myrks in Heat, who won the group stage by a fair margin. 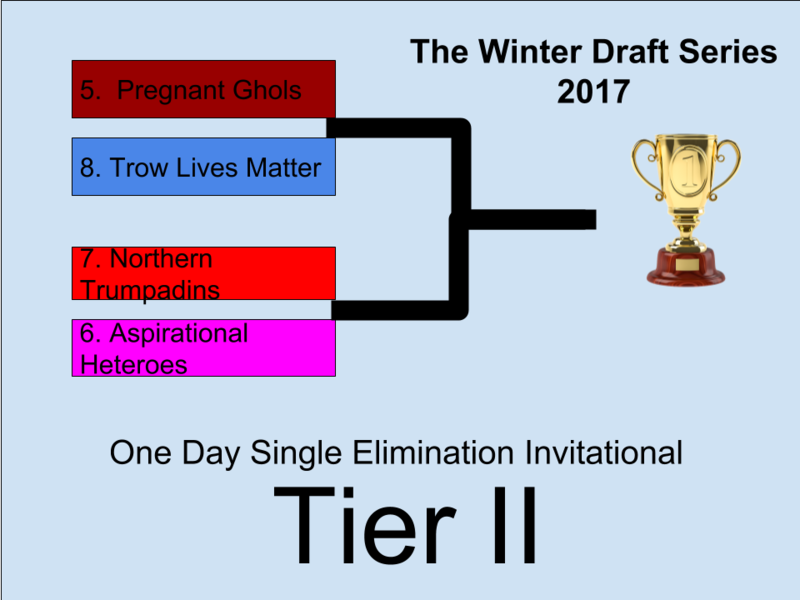 This weekend they, SC, SJWS, and $oMR will be drafting the remaining players on their team to participate in the large 2team tournament which will conclude TWDS. This opens up a bye week during the schedule, as the captains of those respective teams will be gathering next weekend (Saturday, 2PM EDT) to draft the remaining players on their teams. Because of this, I will be hosting two separate one-day single elimination tournaments, on Saturday at 3PM EDT. I have used the results of the group stage to seed the 8 teams into two divisions, Tier I and Tier II. I tie broke SC/SJWS seed with the results of their group stage match, due to having similar results at the end of the group stage. 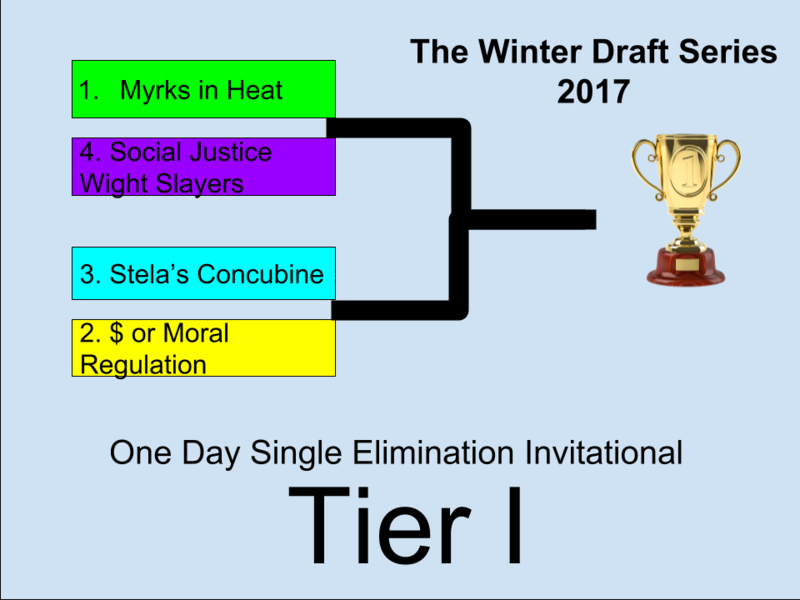 Disclaimer: Results of this One-Day SE Invitational DO NOT impact or reflect the results of the group stage, draft, or upcoming Large Team tournament. The invited teams will play in their scheduled Best of 3. Winners will advance to a Best of 5 Final Round. Winners of the Best of 5 are the champions of their tier. Teams should be gathered by 3PM EDT. Teams can call forfeits on their opponents by 3:20 if they have not fielded, and advance to the final round in this way. Minimum participants per entry is 1, there is no maximum. Team Rosters will stand as they are prior to the draft, i.e. the Tier 1 teams' rosters do not reflect their additions from the draft. The draft is for a separate event hosted by Akira, it does not have anything to do with this event. Subs are allowed, but should play for their team given the opportunity rather than play for another team. Subs are persistent within a tier, a player who substitutes for one team may not substitute for another team within the same bracket. We will use a map pool for this event. The map pool used is the 12 maps from the group stage. Picks will alternate following each game, the team with the higher seed will get the first pick. We will have two champion teams following this event. This is a one day exclusive tournament meant to wrap up the last 4 weeks of group play with the smaller teams. I hope you enjoy the structure and the games. So today is an elimination round but the real tournament will start the next weekend? Today is two separate one-day tournaments, should be no more than 8 games for any team involved. The "Real" tournament resumes next week, you are correct correct. MiH beats SJWS 2-0 in the Tier 1 Semi-finals and $oMR 3-1 to win the Tier 1 Finals ! AH beats NT 2-1 to advance to the Tier 2 Finals!. PG beats AH 3-2 to win the Tier 2 Finals! Congrats to Myrks in Heat and Pregnant Ghols for winning their respective tournaments ! Thanks for showing up and participating ! Now lets put these old rosters in the dust as we move on to the Double Elim ! Aspirational Heteros went out in a bloody blaze of red hot glory.